Early in human evolution people discovered that stone can be used to make tools. They found that flint, which is close behind diamond in hardness, fractures easily to give razor sharp edges. In the Palaeolithic period, or early stone age, humans developed great skill at fashioning beautiful tools such as the hand axes shown right. People were nomadic hunter-gatherers who probably made tools on the spot to skin and butcher large game. Later, in the Mesolithic or middle stone age, still nomadic, people developed skills at making flake tools including tiny Microliths that could be mounted in a wooden shaft to make arrows or spears and the first purpose-designed carpentry tools like the Tranchet adze (right). In the Neolithic or new stone age, people began to live in agricultural settlements. They had time to make intricately flaked tools such as scythes and polished axes (Below right). The processes they used left distinctive marks on the tools they made. If you get a suitable large piece of flint (called a core) and strike it near the edge with a round pebble, called a hammer stone, you will break off a flint flake. In the palaeolithic period this technique was used to chip flakes away, leaving the core as the tool. In the Mesolithic, this process was commonly reversed - large flakes were chipped away to make scrapers and cutting tools and the core was discarded. To get decent sized, usable flakes, you need to prepare the striking surface - called the platform - so it is flat and at less than 90 degrees to the front face of the core. When a toolmaker (known as the flint knapper) strikes the platform of his/her core with a hammer stone near the edge, a flake breaks away, leaving a distinctive mark of the impact. This is a sharp lump that juts out just below the point of impact and often a bulge that tapers away down the length of the flake in the direction in which it was struck. These are the striking point and the 'positive bulb of percussion'. 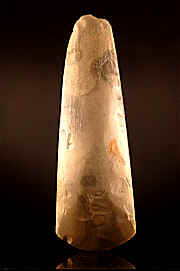 There is a corresponding concave or negative bulb left behind on the flint core from which the flake was struck. If the toolmaker then strikes a second flake from the same place, but a few millimetres further back from the platform edge, the thin flake that comes away will have a positive bulb of percussion on the inside surface (front) and a negative bulb of percussion on the outside or back, giving a very distinctive curve to the side view or section through the flake. Sometimes, the toolmaker will prepare his or her target flake, taking off some long thin preparatory flakes, creating shallow facets on the core. What were flint tools used for? It's natural to wonder what our ancestors used their tools for and it's tempting to imagine all kinds of purposes, but the reality is that we can never know exactly what use they were put to. 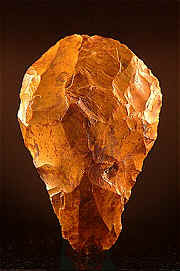 For example, it used to be thought that palaeolithic axes were hafted in wooden handles. 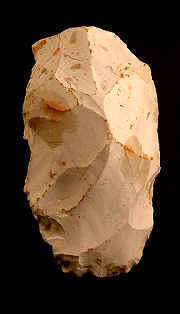 Later they were described as 'hand axes' in recognition of the fact that no evidence exists for hafting. Today they are described merely as 'bifaces' in recognition that they may not even have been used as axes at all. It has even been seriously suggested that beautifully crafted early Palaeolithic bifaces may have been marriage offerings! All we can say for certain is that our ancestors needed to skin and butcher the game they killed, and they needed to process the hides by scraping to make them suitable for clothing and shelter. At least some of their tools must have been made for this purpose. They also needed to make fire and, again, some flints must have been intended for this end. To what extent nomadic people carried tools about with them ('curated' them) and to what extent they made them on the spot is not known with any certainty. Tools are sometimes found made from distinctive local flint, many miles from their point of origin, but this could equally well be evidence for curating tools or of trade in tools or raw flint. In this sea of uncertainty there are a few knowns. Side and end scrapers were almost certainly intended for processing skins. The tranchet adze, which could be re-sharpened by taking a flake across its working tip, was almost certainly used for carpentry and its introduction in the Mesolithic coincides with the building of timber fishing platforms, remains of some of which have been found. Making spear shafts and arrows must have required suitable spokeshaves or notched pieces. Microliths have been found embedded in wooden handles preserved in peat bogs. The rest is, at present, speculation.